Lewis Hamilton believes that Jenson Button has outperformed him this year, adding that even an improvement to his form over the final five races would “not mean a lot” to him. 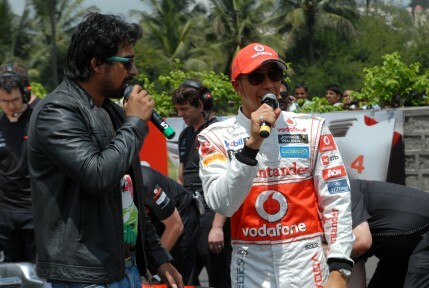 After driving his MP4-23 â€“ the car with which he won the 2008 driversâ€™ championship â€“ on a demonstration run through the streets of Bangalore on Tuesday, Hamilton was asked how he felt to be 17 points behind his team mate. “Jenson’s done an incredible job. I feel he’s done a better job all season, really,’ Hamilton said. “So even if I did a better job in the next five races it doesn’t mean a lot to me. I mean, it’s through a whole year. Hamilton was also asked about his collision with Felipe Massa in Singapore and their ensuing clash in the interview pen, which caused the 26 year-old to leave the circuit without giving any interviews. â€œI was able to just ignore it and move on,â€ he said. An estimated 40,000 turned up to watch Hamilton in Bangalore and the McLaren driver said he was looking forward to returning for next monthâ€™s inaugural Indian GP on Oct 30.
â€œIt’s incredible,â€ said Hamilton. â€œI’ve visited India many times over the last couple of years and it’s never been more exciting to be here than now.